Sunclan Territory: A large beach, like a desert but it is close to the ocean. Has lots of dunes, shrubs and reeds. They have a large training hollow in a dip between two dunes where there are some reeds and bushes. Unlike Oceanclan, Sunclan doesn't fear flooding as their camp is far enough away from the ocean not to even worry about it. There are barely any trees on their territory. Their training hollow is in the northeastern part of their territory, so by the beach, but also close to the Oceanclan border. There are lots of underground springs in their territory. There are also four small ponds in their territory ontop of dunes, all fed by springs. Three of them are by the Oceanclan border. The last one is close to the Moonclan border. Sunclan Camp: Sunclans camp is near their southern borderline with Moonclan. They don't fear invasion because Moonclan is neutral.They have their cam their, so they would be safe from floods from the ocean during storms. Their camp used to be almost right next to training hollow as it made sense from them to be close by. But when Oceanclan and Lavaclan invaded their camp during the dawn of the clans they relaized they might have to move it. Especially when Oceanclan and Sunclan developed hatred for each other and also when a flood nearly flooded their camp. They then took it apart and moved it to its current location. Their clan is on a large dune, so tall that you can see the sea! The dune is called with long, tall reeds and lots of bushes and a few trees as well. Under the dune there is an underground spring that is able to give water to some trees. The next two dunes have this as well. There is a pond by their camp where they go to fetch water. It is shallow so it is almost impossible for cats to drown. It has nice, clear water. Their camp is the most noticeable of the clans as you can see their dune almost anywhere in their territory as it is all open. It is made of reeds and branches. Their entrance is facing the south. The order of the dens from the entrance are deputies den, medicine cat den, elders den, nursery, apprentices den, warriors den. In the middle of the camp there is a yellow rock with the leaders den on it. It is where the leader makes their announcements. It is called Highden. Sunclan Wildlife: Sunclan usually eats rabbits, mice, voles, shrews, birds and sometimes if they are starving, fish. They get foxes in their territtory becuase it is easy to have a den there, but never badgers. Only if they are passing through. They also have tapirs, capybaras, okapi, and bears in their territory as well. The bears usually live on the border between Sunclan and Moonclan. They don't hunt them becuase they are either bigger then them or else they don't like the way they taste. Foxes are a real problem in their territory so they are like experts at dealing with foxes. Sunclan Traits: Sunclan cats are usually proud, defensive, ambitious, but also quick-witted, and fiercely loyal and tough. Their enemy most of the time is Oceanclan. They don't like Lavaclan all that much either because Lavaclan helps Oceanclan, but they are on okay terms with them. 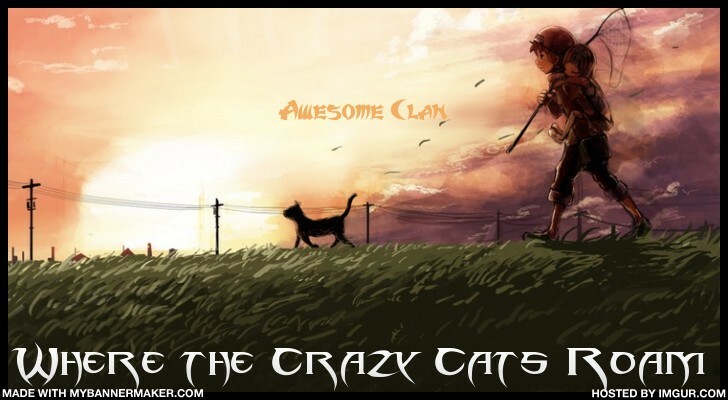 Sunclan cats are usually also very fast and quick and have very good reflexes. They prefer large, wide open spaces to enclosed spaces. They are greatly claustrophobic. They usually sleep outside of their dens. Sunclan is kinda a mixture of Shadowclan and Windclan. Sunclan History: Sunclan was founded by Sunflame, who along with six other cats formed the clans as a way to preserve the traditions of the clan Snowclan. Sunflame was the eldest sister to Forestcreek, founder of Forestclan and Twilightclaw, founder of Twilightclan. They weren't all that close to each other as Sunflame was very harsh. There was a age difference between them as well and Sunflame had been born in the first litter while Forestcreek and Twilightclaw had been born in the third litter. Sunflames life as a kit was hard. All off her two other siblings in her litter, the first litter, had died becuase they were sick and weak. Sunflame worked to be stronger and trained to be stronger. She saw her mother give birth to another litter of kits-all dead. Her mother was devasted and her father was angry. After a long while Sunflames mother had a third litter and the two kits survived. Sunflame thought that they had it easy as their mother mooned over them. She hadn't had that. Her mother had been deppressed, her father had gotten sick and she had to take care of herself. Sunflame loathed the new kits. Sunflame, Forestcreek, and Twilightclaw are related to Lavafall on their mothers side. Sunflame thought he was an okay cat, but then she found that Oceanshine, founder of Oceanclan had fallen in love with Lavafall and had his kits. That was breaking the warrior code and in order to protect and preserve it she attacked the camp and killed two of the five kits. She thought that what she was doing was right as they needed to preserve the warrior code. She also scarred another kits. Ever since then Oceanclans enemy was Sunclan, for what they had done in the past and what they still did in the present. Lavafall and Oceanshine were sad and angry and formed and allegiance and attacked Sunclan which resulted into a short war. Oceanclan and Lavaclan won. Oceanclan wanted to chase Sunclan out, Lavafall forgave Sunclan, as Sunflame was his cousin and told Oceanclan to let them be. Oceanshine still had a grudge on Sunclan, and ever since then, Oceanclan has hated Sunclan and Sunclan, Oceanclan. Lavaclan was able to forgive and forget but in a battle they will still side with Oceanclan but are always ready to forgive. Eagletalon felt unusually tired and sat down, stopping and watching the cats in SunClan camp. Then she slowly got up. I can't sit around on such a good day. Deputies don't act like this, she scolded herself. I was gone for a long time so I don't know what happened these day. Blackhole was already out and having a walk in the camp but he wished he could meet his mate quickly. But he thaught she will be busy so he went in the worrior`s den and lay down. Goldenleaf organized herbs in her den and wondered where Coralpaw was. Sharpfang looked around the camp and spotted Eagletalon. He walked over. "Can you organize a hunting patrol?" He asked her. ooc: Runatone, did you leave before or during the clean up? uh, Flame, aren't Glowheart, Lightpatg, and Fallenstar in MoonClan? I'll organize a hunting patrol anyway. Eagletalon stood up. "can I have Jasperhowl, Cactussun, Snowstorm, and Auburnpaw on a hunting patrol with Twoflower as the leader?" After announcing the hunting patrol, Eagletalon went to find Blackhole. Shadowheart looked around the camp and decided to go hunting. She walked out of the camp. Sharpfang walked into Goldenleaf's den. "Hey! How are you?" He asked her. Eagletalon marched into the warrior's den. "Get up, sleepy-heads! Time for a hunting patrol. Where is everyone?" Well I was gone because I was quite busy at Japan so... yeah. and I`m still quite busy, so I can`t be on too much. I will sart coming on everyday starting from 20th. Snowstorm stood up slowly and stretched. And then he yawned. "Good morning Eagletalon......" with his eyes half closed. He was half-asleep. Blackhole looked up at Eagletalon. "Morning." "Snowstorm! Wake up! You're on morning hunting patrol with Twoflower, Jasperhowl, Cactussun, and Auburnpaw," Eagletalon blasted in his ear, and to all the other warriors who were in the patrol. She turned to Blackhole and purred. "Good morning to you, too." Blackhole smiled, and licked Eagletalon`s ear. He lay down and started day dreaming. Snowstorm finally woke up. "Whoa!!" and he asked quickly. "Where is Twoflower!!!!!??????????" She looked fondly at Blackhole. Back to Snowstorm, "Seriously though, where is Twoflower? And everyone? We have a patrol to go on!" Eagletalon mewed. Snowstorm dashed around the den. "Twoflowerrrrrrrr~! Patroooooool~!!!!!!!!" Blackhole toataly ignored Snowstorm and smiled warmly at Eagletalon. "Don`t work too hard. Rest sometime." Eagletalon purred at Blackhole's caring remarks. "I'm still going to work myself as hard as I can to be a great deputy!" she mewed. "Sleep and rest can wait. The clan comes first." "Ugh. Okay!" said Twoflower as he roused himself from his sleep. Shame he had to go on a patrol when he was having a dream. They should a rule on the warrior code for that- No warrior is allowed to awaken a other warrior that is having a dream. He got up and padded out of the den and said to his former apprentice, Snowstorm "This will be the first patrol since you were made a warrior." he said happily. "Letsago!" he exclaimed as he bounded out of the camp. Coralpaw was up and all awake and energetic. She was bouncing with excitement at what she would learn. "Goldenleaf what things am I going to learn today?" she asked as her eyes shone with excitement. Auburnpaw was already awake as he had been all night long. He hadn't been able to contain his excitement at finally being an apprentice. He was now one step closer to being a warrior! He looked around for his mentor and then padded to the warriors den to see where his mentor was. Apritcotpaw still slept. Even though she was made an apprentice you still needed your sleep! Especially for her, since her sleep is her beauty sleep. Apricotpaw rolled over in her sleep and sighed. Being an apprentice sure was tiring. Myrtlerose and her mate, Jasperhowl padded out of the camp along with Myrtlerose's sister Olivefern and Olivefern's friend, Redcry. Myrtlerose and Jasperhowl's tails were entwined and whispering to each other and giggled. Olivefern felt jealous. Myrtlerose was harsher then her and yet she was able to find a mate lickety split. She truthfully really liked Redcry, who was one of her best friends. But she wasn't brave enough to confront him or anyhting like that. As her clanmates always said she was always so scared for something and always had an excuse. She hoped he liked her too, but truthfully, she didn't know at all. Her sister and Jasperhowl had been pressuring her to confess her feeling but she was afraid she would be rejected and that would pain too hard for her to bare. Olivefern sighed. Why did life have to be so hard? Redcry was feeling ackward. Myrtlerose and Jasperhowl, his rival, were now mates and they didn't seem to be rivals anymore. Being around his former rival who now had a mate made him feel ackward, especially since he was on a hunting patrol with the cat he liked, Olivefern. He wanted to confess to her as he thinked she liked him, actually he was sure of that. He wanted to confess when they were out hunting, hopefully. He watched as Myrtlerose and Jasperhowl whispered to each other and muttered "Lovebirds." Sunblaze, the other medicine cat was soo busy organizing herbs. She thought they might need a few more herbs, the last days of greenleaf were drawing nearer. They would need some herbs for leafbare, with its cold climates. They also needed to deal with the Deadly Falter. They would need to find a cure. Eagletalon chased after Snowstorm and Twoflower. "Wait! Aren't you supposed to go with the other people in your patrol, Jasperhowl, Cactussun, and Auburnpaw? And Twoflower, I know you're sore about me waking you up, but everybody is supposed to be awake already! Why is everyone acting so tired?!" "Oh," Glowheart meowed. "I'm good." She purred. Sharpfang licked her cheek. "So am I." ^you mean Goldenleaf, right? I'm geting really confused, sorry. Eagletalon wondered where everybody was! Was it always so hard to organize just one hunting patrol?! Blackhole knew what Eagletalon was thinking. He stood up and licked her ear. "Don't worry... They will come soon..." and he padded out of the camp and grabbed Snowstorm and threw him in the warrior's den. Snowsorm hissed. "Heeey!" Blackhole slapped his mouth with his tail and went asleep. Snowstorm said unhappily. "I wish I am Blackhole...... big and strong enough to lift me up and throw me at the ground." and Snowstorm froze a moment. And he used his biggest sound and screamed. "WAKE UPPPP!!!!!!" Blackhole opened his eyes and looked at Snowstorm. "You will scare all the prey away......" and he closed his eyes again. Eagletalon purred at Snowstorm and Blackhole. She wanted to tell Blackhole that it was unnecessary but gratifying, however she didn't want to wake him up. "Maybe it's because Boarstar died. Everyone is just sad and tired and grumpy." he said as he tried to manage a smile. "We'll replace Cactussun and Auburnpaw!" exclaimed Myrtlerose, Olivefern and Redcry. "Ok so Snowstorm, Redcry, Jasperhowl, Myrtlerose, Olivefern and I shall go on a hutning patrol." said Twoflower. "Let's go!" exclaimed Jasperhowl as Myrtlerose, Olivefern, and Redcry foloweed Twoflower out of the camp. "What am I going to learn next?" Coralpaw asked Goldenleaf. Auburnpaw was thanful that he didn't have to go on the hunting patrol. He would rather go training then go on a hutning patrol. He then went to the warriors den and called "Cactussun!" so he could go training with his mentor. Eagletalon was relieved. Finally, a hunting patrol! She still wondered where the lazy bums Cactussun and Auburnpaw were. She sighed; maybe everyone was all grumpy and tired because of Boarstar's death. It had affected all of them. Speaking of that, Eagletalon wondered how Mazestar was doing. Snowstorm was so happy that he can go to his first hunting patrol! He purred happily "My first patrol! Let's go Twoflower!!!!" and he dashed outside. Blackhole slept peacefully and calmly. He was smiling in his sleep. Snowstorm looked back at Blackhole. Blackhole's bedding was all messy. He exclaimed to the apprentice's den. "Someone change Blackhole's bedding please!" and he turned front and purred again. "Let's go!" Aoricotpaw, unfortunatly, heard Snowstroms cry which woke her up from her beauty sleep. "Ugh!" she cried but then tried to act all polite and nice. She padded out of the camp to get moss for Blackhole, but then wondered, where would she find moss on a beach? As she walked out she kept on pausing for no reason. She thought it was her mind telling her to make sure she knew where she was going, but she wasn't sure. Twoflower led the hunting patrol to the southern part of the territory, near the Moonclan border. "He might as well do a little border patrol here to help out the border patrol." he said. "Snowstorm, Redcry you two will help me with the border. The est of you can go hunting. After we are done with the border the two of you can go hunting as well." he said as Redcry walked and followd behind Twoflower as they marked the border. The rest of the patrol dispersed. Myrtlerose and Jasperhowl went off together because Myrtlerose had something exciting and suprising to tell Jasperhowl. Olivefern, knew exactly what it was. "Jasperhowl?" asked Myrtlerose when they were a fair enough disantance from the rest of the patrol.....and eavesdroppers. "Yes, Myrtlerose?" he asked her. "What is it you wanted to tell me?" he, unlike Olivefern didn't have a single clue what it was Myrtlerose was going to tell him. "I'm pregnant. With kits. Well, I guess the kits part is obvious ain't it?" she asked as she smiled broadly and laughed. "Really? You mean it? HOORAY! Oh Myrlterose I am so happy. Do you know how many? What genders? What names do you like? I really care what names you like because I know they will be awesome nam-" said Jasperhowl as he talked so rapidly, and wa sinterupted by Myrtlerose. "Shhh. Don't tell the others yet. I still need to go to the medicine cats den to confirm my pregnacy and how many and what genders then we can work on the names." she said as she smiled. "For now, let's hunt!" she exclaimed as she raced off. Eagletalon also noticed Blackhole's bedding was messed up. She removed the old moss and tidied the remainder. She walked out of the warrior's den and remembered neither Sharpfang or her had made a border patrol this morning. She walked over to the medicine cat's den where Sharpfang would probably be. "Sharpfang, do you want to make the border patrol?" she asked. Snowstorm did as what Twoflower said. Blackhole didn't really realize what's happening to his bedding, so he kept sleeping. Eagletalon decided to make a border patrol anyway. instead of chasing down the specific cats who were supposed to be in the patrol, she ran to the middle of camp and shouted loudly, "Who want to be in a border patrol?!?!?!" Eagletalon hoped she hadn't waken up the elders or Blackhole. Blackhole was a great sleeper, when he sleeped more then 15 minutes, he won't wake up until someone shout by his ears. Snowstorm walked around in the boarder. He saw a rabbit. He whispered "Ah-ha!" he slowly padded up, and sank his teeth in the rabbit's neck. The rabbit was killed. Snowstorm smiled. "Gotcha!" If you want any of these characters please reply them below. Goldenleaf turned and looked at Coralpaw. "Hm... How about I show you where you can find all the herbs?" "Sure!" exclaimed Coralpaw as she jumped up and down with much excitement. Twoflower pounced and killed the rabbit. Myrtlerose and Jasperhowl had worked together and had caught a squirrel that had raced over the border from Moonclans border. They smiled and then tails entwined they returned back to Twoflower and Snowstorm. "Are we ready to go back to camp?" asked Jasperhowl, who was in the great mood. "Um....yes." said Twoflower wasn't really listening. He had been surprised by happy Jasperhowl looked. He had never seen him that happy before. Eagletalon went to patrol the borders alone because she felt like it. Along the way she killed a finch and buried it. Goldenleaf purred at her apprentice and led the way out of the camp and across the sandy ground. She led the way over dunes toward the Moonclan border until she came to a big pool of water. She sniffed some of the green plants near the edge of the cool water. "Can you tell me what this is?" She meowed. Eagletalon sniffed at the plants on teh sand covered floor. So far, the borders were still standing. She decided to return to camp after looping around the borders again and picking up her finch. Blackhole was woken by Aquanight. "Um......" Mewed Aquanight. "Where is Snowstorm? sorry to interrupt......" Blackhole sighed and mumbled. "In a patrol with Twoflower......" and he slept again. Aquanight siged, and sat next to Blackhole and mewed. "Oh...... I kinda miss Snowstorm......"
Snowstorm bounced on a mouse and buried it. He siged. "I'm strange. I have met Aquanight this morning but I kinda miss her......"
Eagletalon returned to camp and laid down her prey. "All of the borders are intact and untouched by the other clans," she mewed to no one in particular. She spotted Blackhole and Aquanight in the warrior's den and, and nodding a polite greeting to Aquanight, decided it was time for Blackhole to wake up. "Blackhole!" Eagletalon purred,"Time for you to wake up, sleepyhead!" Blackhole opened his eyes, and looked at Eagletalon. "Good morning......" and he stretched, then yawned and padded out from the den. Aquanight smiled at Eagletalon. Sorry, I can't go on until next Tuesday or something. Please play my characters! Anyone! Eagletalon smiled back in Aquanight's direction and rolled her eyes as if to say toms. Then she left the den to see if any patrols needed to be organized or something. Blackhole stretched again, feeling Eagletalon was maybe saying Toms and he knew what did it mean. A lot. Actually, how does a patrol end? do the patrol leader call the characters?? We need to spread the Deadly Falter! And the patrols report anything unusual. Yes, the patrol leader calls/finds the other cats to tell them to get their prey or something and return to camp. Eagletalon stopped. She sat down and got up again, feeling unusually slow like she was moving in honey. Snowstorm finished the patrol, and padded to the camp with 2 mouses in his mouth. Aquanight pounced on him. "Snowstorm! You're back! I'm so happy!" Snowstorm looked back and mewed. "Hife faffy foo fo fef fof fe! (I'm happy too so get off me!)" Awuanight purred. "Wha?" still smiling. Snowstorm yowled "Fef fof! Fife foffa faff! (Get off! I'm gonna fall!!!)" Aquanight nodded. "Oh right. finally getting the meaning. Eagletalon got up and stretched. She was getting stiff these days. She smiled at Snowstorm and Aquanight, and then walked up to Blackhole. "Blackhole, do you want to go on a hunting patrol with me? Also, I need to ask you something," she mewed. "Okay," Eagletalon meowed. "Let's go that way." OOC-Hey guys. Sorry I haven't been able to post recently it is just that I started school and am kinda busy with homework and getting everything ready for all of my classes and such. I promise I will be on during the weekend from Friday to Sunday and from there I will try to be often more. It looks like lots of things are heating up with all of the major events taking place in the clans. Blackhole followed Eagletalon, wondering what was she going to tell him. Will Blackhole and Eagletalon have kits? Myrtlerose and Jasperhowl returned to the camp. Jasperhowl had taken a long time because for a werid reason he had been very slow and he hadn't been able to catch up to Myrtlerose. Myrtlerose was worried about her mate. "Are you okay?" she asked him when they got back to the camp. "Yeah. I just need to lay down and sleep for a few moons." Jasperhowl joked. "Hahaha." said Myrtlerose sarcastically. Even though Jasperhowl said he was fine, didn't mean he was fine. She was still very worried. She would talk to the medicine cat to check on him if he was still the same way. "Okay." she said as Jasperhowl slightly nodded and then walked, slowly, to the warriors den where he laid down and quickly fell asleep. Myrtlerose decided to go eat so she grabbed a rabbit from the pile and began eating, her worried thoughts growing as she ate. Coralpaw thought for a while, noting the plants small purple flowers, before answering by saying "Comfrey?" she asked. "I mean comfrey can have small purple flowers as the flowers on comfrey come in purple, pink and......white, I think was the last one. But then again it could also be lavender as lavender has small purple flowers as well. But then again it might not be lavender as lavender is hard to find while comfrey is medium to find. So in conclusion.....it is comfrey!" she finished. She was proud, it took some time, more than she would have liked but she had got it in the end. Or so she hoped as she waited for Goldenleaf's reply. Twoflower sat in the camp by the elders den eating his rabbit. He had caught one so they could all share but when he got back they were still sleeping. Oh well. More for him! He ate quickly and feeling still hungry grabbed a sparrow from the pile. After finishing the sparrow he snagged a another one. Then after finishing that one he sneaked in another sparrow. He decided to stop or else he would get fat and he did not want to get fat. It was just a habit he had gotten when he was at that cursed desert island. You never knew when you next meal would come. He then layed down and basked in the sun. Olivefern and Redcry talked and talked.....and talked some more for a long time. When they came back though they were smiling and their tails were entwined. Redcry had confessed his feelings to Olivefern and so had Olivefern! So now they were lovers. Redcry and Olivefern were tired from all this confessing, though. They both decided to go take a nap for a little bit seeing as there was not much to do around camp. They both so tired that they actually skipped eating something! They both layed down in the warriors den and dozed off into a deep sleep. Myrlterose saw her sister enter. She was estactic. Now she could talk to her sister about her worries. But instead of going over to talk to her, or even get food, Redcry and Olivefern went right to the warriors den and settled into their nests and fell asleep. Well humtpy dum. Myrtlerose would have to talk to her tomorrow and teach her a lesson for not talking to her! She saw that her sister had Redcry had had their tails entwined-so cute! Now her sister had a lover. Did she hear kit mews in the future? HAHA! She would tell her sister that later when she woke up. But soon her though became more worried. Everyone was tired....but why? Apricotpaw was out training in the training hollow some moves. Her mentor, Honeysong had been sleeping so soundly that she hadn't been able to rouse her! Unbelievable. So now here she was slef training herself. She wondered if that had ever happened to an apprentice before. She guessed yes. Her lazy brother was still sleeping when she had left. He was usually so active......but now he was so lazy! She guessed things changed when you became an apprentice. Here she was being active. Auburnpaw spelt soundly and peacefully, not moving a muscule. Sunblaze had been organizing the herbs in the medicine cat den and thowing out the old one but for some reason that had gone and made her all tired so she decided to sleep, but not after getting something to eat first. She ate a sparrow and then went to her nest and fell into the deepest sleep she had ever sleeped. Honeysong slept soundly in her nest in the warriors den, surrounded by other deeply sleeping warriors. Mazestar felt so very tired. Fire-eye had said so as well so he had given him a rabbit he had caught for Mazestar to eat. Mazestar accepted it happily he ate it and then fell right to sleep. After eating the rabbit his stomach had gone quesy so he decided that sleep would be good for it. He had decided that he shouldn't have ate all the rabbit. Anyway now he was sleeping peacefully. Fire-eye returned back to Darkstream. "Mission complete." he said to her. "I know, I saw." she replied. Their plan had been simple, Fire-eye went out to get some poison while Darkstream hunted for a rabbit. They would use the poison and put it into the rabbit and then give it to Mazestar. It was the master plan. Especially since Mazestar seemed to be weak and sick and tired with a sickness of some sort he would usually succumb to the poison and lose one or hopefully more of his lives. Fire-eye had been able to get foxglove seeds and holly berries. Darkstream had been dissapointed he had not gotten any deathberries but it would have to do for now. Hopefully the foxgolve seeds would stop his heart and kill him. They both wondered if that happened would he still be alive even with the nine lives. They would need to wait and see. Now all they needed to do was to wait. They shared a rabbit as they talked quietly among them selves. yes Blackhole and Eagletalon will have kits. I'm thinking of two, so if you want to, you can play one. ic: Eagletalon stopped and turned to Blackhole. "This is really important..." She knew what she was going to say wasn't what he expected. "Have you been a lot more tired lately? And did you see the cats? Why is everyone so sleepy?"